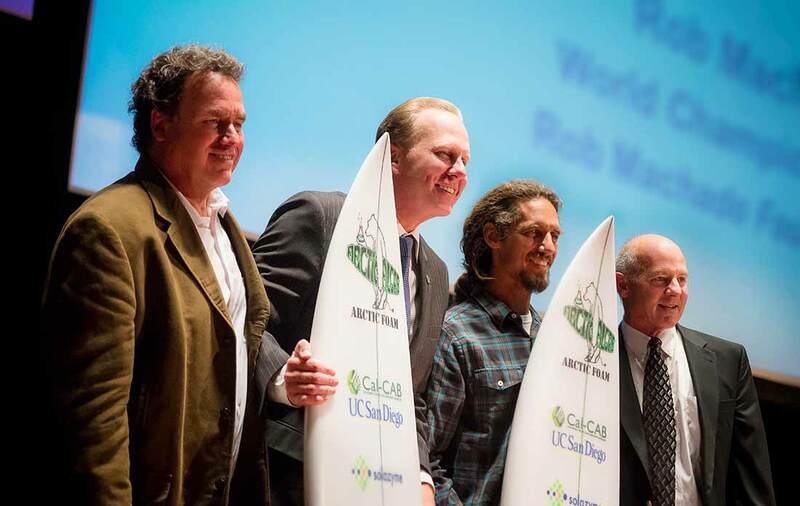 The surfboard was publicly unveiled and presented Tuesday evening, a day before Earth Day, to San Diego Mayor Kevin Faulconer at San Diego Symphony Hall, where he hosted the premiere of the National Geographic “World’s Smart Cities: San Diego” documentary. The program, which features innovations from UC San Diego, is scheduled to air Saturday, April 25 and May 2 on the National Geographic Channel. The project began several months ago at UC San Diego when undergraduate biology students working in Mayfield’s laboratory to produce biofuels from algae joined a group of undergraduate chemistry students to solve a basic chemistry problem: how to make the precursor of the polyurethane foam core of a surfboard from algae oil. Polyurethane surfboards today are made exclusively from petroleum. Students from the laboratories of Michael Burkart, a professor of chemistry and biochemistry, and Robert “Skip” Pomeroy, a chemistry instructor who helps students recycle waste oil into a biodiesel that powers some UC San Diego buses, first determined how to chemically change the oil obtained from laboratory algae into different kinds of “polyols.” Mixed with a catalyst and silicates in the right proportions, these polyols expand into a foam-like substance that hardens into the polyurethane that forms a surfboard’s core. To obtain additional high-quality algae oil, Mayfield, who directs UC San Diego’s California Center for Algae Biotechnology, or “Cal-CAB,” called on Solazyme, Inc. The California-based biotech, which produces renewable, sustainable oils and ingredients, supplied a gallon of algae oil to make the world’s first algae-based surfboard blank. 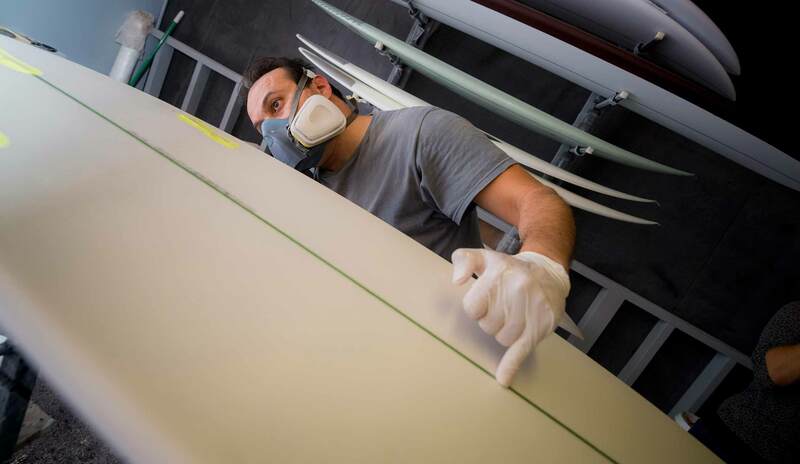 After some clever chemistry at UC San Diego, Arctic Foam successfully produced and shaped the surfboard core and glassed it with a coat of fiberglass and renewable resin. 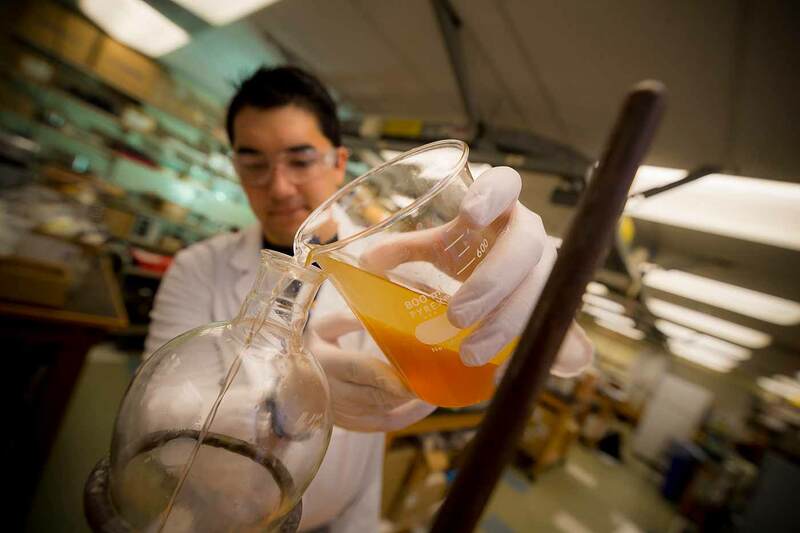 UC San Diego undergraduates in the Biodiesel Action Awareness Network (BAAN) determined how to chemically change the oil obtained from laboratory algae into different kinds of “polyols” in order to produce the core of the algae surfboard. But now, he explained, surfers can have a way to surf a board that, at least at its core, comes from a sustainable, renewable source. “In the future, we’re thinking about 100 percent of the surfboard being made that way—the fiberglass will come from renewable resources, the resin on the outside will come from a renewable resource,” Mayfield said. “This shows that we can still enjoy the ocean, but do so in an environmentally sustainable way,” he added. UC San Diego’s California Center for Algae Biotechnology will be featured in National Geographic's new series “World’s Smart Cities.” San Diego will be the only city in North America featured in the program, which airs at 8 a.m. April 25 and May 2 on the National Geographic channel.